Tonight I have the pleasure of doing something a lot of writers don’t enjoy – talking to people in public. 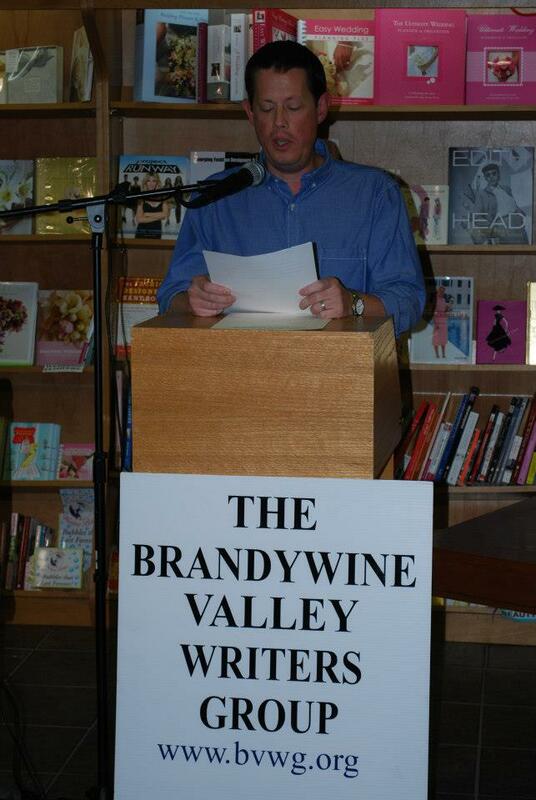 Yours truly at a Brandywine Valley Writers Group public reading in the fall of 2012. Unlike many writers, I like public speaking. Maybe too much. OK, I’ll shut up now. The topic will be indie and self-publishing and I’ll be one of three writers on a panel made up of members of the Brandywine Valley Writers Group, a great bunch of professional, amateur and aspiring writers based in West Chester, Pa. Joining me on the panel will be fellow authors Jim Breslin and Jorgen Flood, both of whom have gone about their own publishing adventures via independent or self-subsidized means. Jim is an editor by day, writes short stories and has produced his own anthology titled Elephant, as well as shepherded the excellent Chester County Fiction anthology, featuring a number of friends and fellow BWVG members. Jim is also the founder of the West Chester Story Slam, a monthly storytelling competition that is now so popular he has to sell tickets and has since spread to other areas of Southeastern Pennsylvania. Jorgen, who hails from Norway (cool accent! ), has three titles to his name, non-fiction and historical fiction among them. One of the reasons I was invited was to discuss the unique structure of Codorus Press, the publishing collective I helped form along with my good friend and former newspaper colleague Wayne Lockwood. But along with chatting up the many upsides (and occasional downsides) to publishing independently, one of the things I always stress when speaking to groups of writers is this: Whether you’re publishing through traditional means or independently, the fact remains that you can’t just write a book, put it out there, hide at home and hope it sells. It’s incumbent on every author – no matter how his or her book is published – to get out there. Talk to people about your book. Make connections. Pick up a copy of your book and put it in someone else’s hands and tell them how good it is. Inspire other writers to do just what you have done. I’m constantly hammering away at the same point: Wayne and I are just a couple of guys who had an idea and a manuscript and decided to do something different, and there’s nothing stopping anyone from doing the same thing. The fact is that being a writer can clearly be divided into two areas. First, there’s the artistic. If you’re a fiction writer, you’re creating something new entirely out of your own imagination. If you’re writing non-fiction, you are using your journalistic talents or your own experiences to convey to the reader a truth or your own observations and experiences. Second (and this is the bit that lots of writers like to deny), there’s the commercial. Once the art has been rendered, you must now think of the resulting work as a product that has to be appropriately packaged, marketed and sold. And part of that is being willing to get out there and talk to people. Sure, social networking and PR services will help. Great reviews are wonderful. But I’m convinced that one of the most important parts of being a writer – or any kind of artist – is making that connection with the audience. I will admit that I have a slight advantage in that I’m a naturally gregarious person who is comfortable speaking to groups. But not every public appearance you make needs to rank up there with other great moments in public speaking. The key is to make yourself available, be friendly, respectful and willing to engage. Most of all, be appreciative that anyone has shown up at all, and those who are there want to hear what you have to say.